We are all having roles in the corporations we work, whether as a developer, project manager, test engineer, or one of the thousands of other roles. In today's ever more competitive and changing business world, most even have multiple roles and some are taken on temporarily. The roles define the responsibilities and authorities we have. Businesses are investing in software applications to automate business processes or to support employees in their roles. That means applications need to be able to reflect the roles you play in your organization and only allow you to do things you have authority for in real life. 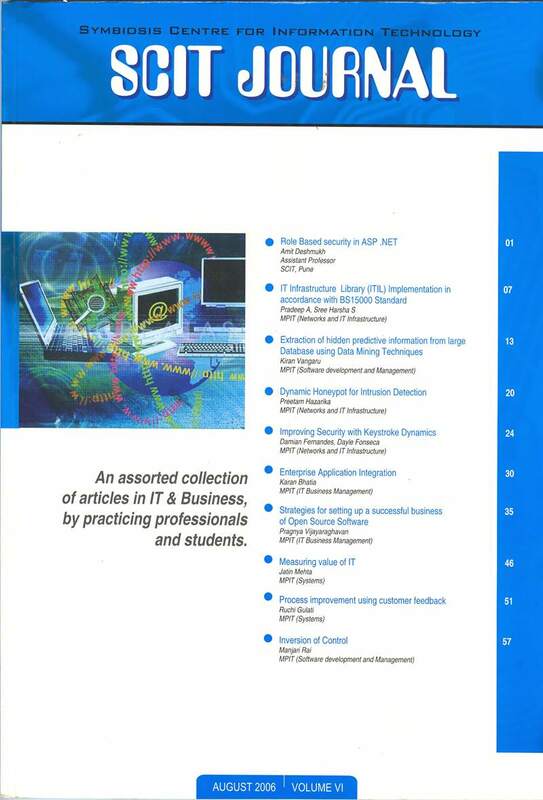 ITIL (the IT Infrastructure Library) is the most widely accepted approach to IT service management in the world, ITIL provides a comprehensive and consistent set of best practices for IT service management, promoting a quality approach to achieving business effectiveness and efficiency in the use of information systems. The IT Infrastructure Library, ITIL, is a series of documents that are used to aid the implementation of a framework for IT Service Management (ITSM). The main focus of it service management (ITSM) itself is generally divided into two main areas, service support and service delivery. IT Service Management is concerned with delivering and supporting IT Services that are appropriate to the business requirements of the organization. ITIL provides a comprehensive, consistent and coherent set of best practices for IT Service Management processes, promoting a quality approach to achieving business effectiveness and efficiency in the use of information systems. IT Service Providers will be striving to improve the quality of the service, but at the same time they will be trying to reduce the costs or, at a minimum, maintain costs at the current level. BS 15000 is the world first standard for IT Service Management. BS 15000 consists of two parts. BS 15000-1 consists of 10 sections, which includes: scope, terms and definitions, requirements for management system etc. BS 15000-2 provides assistance to organizations that are to be audited against BS 15000-1 or are planning service improvements. BS 15000 has been now adopted by ISO and has become ISO 20000:2005. Data mining is the process of data selection, exploration and building models using vast data stores to uncover previously unknown patterns. It uses well-established statistical techniques to build models that predict customer behavior. These techniques can yield the benefits of automation on existing software and hardware platforms, and can be implemented on new systems. Data mining tools can answer business questions that traditionally were too time-consuming to resolve. The purpose of this report is to provide the reader with a thorough understanding of how a technology like data mining can help solve vexing issues during the interactions with the customers. This report includes a brief description of all the data mining techniques used for predicting future trends, and behaviors, allowing businesses to make proactive and knowledge-driven decisions. The first part of the R&D deals with the study of honeypot technology and IDS. During this phase of the R&D, a study was done on the various ways in which these technologies function. Existing in the industry are various types of honeypots but instead of discussing what honeypots can do and how they work, this R&D what honeypots should do, how they could work. That is what in the future would be adaptive to the rapid development and change not only in honeypot technology but also in networks : the dynamic honeypot. Two-factor authentication has become a must in most environments. But the problem is that to implement two-factor authentication additional hardware is always required. By using Keystroke Dynamics software as a possible authentication method we can improve security and reduce cost of implementation and required user interaction. In our R&D we plan to examine an emerging non-static biometric technique that aims to identify users based on analyzing habitual rhythm patterns in the way they type. Commercial software companies face many challenges in growing their business in today's fast-moving and competitive industry environment. Recently many people have proposed the use of an open-source development model as one possible way to address those challenges. This document studies the various strategies and business models used in setting up a business based on open source software. This report analyses the business of commercial open-source software, including why a company might adopt an open-source model, how open-source licensing works, what business models might be usable for commercial open-source products, what special considerations apply to commercial products released as open source, and how various objections relating to open source might be answered. The paper will serve as a reference for commercial software and hardware companies and individual software developers considering an open-source strategy for their business or for doing a competitive analysis of their open source competitors. The value if IT must emerge from a clear and thorough picture of connection between business strategy, business processes business activities on the one hand; and the opportunities and constraints of IT applications and supply on the other. Different levels of organization must be considered to devise systematic consistent indicators of IT value measurement. IT valuation at different levels helps organizations to manage the complexity of IT at each of distinct level. Besides IT value measurement must be aimed at different stake holders. This research paper explores the scope of Inversion of Control (IoC) in developing lightweight J2EE Containers (in context of an open source framework reject, called spring). Using object-oriented design principles and features such as interface, inheritance, and polymorphism, the IoC pattern enables better software design that facilitates reuse, loose coupling, and easy testing of software components.